Wearable – Page 6 – Hello Adorable! Love Boston Terriers? Or maybe you just need an adorable black and white necklace to complete your outfit? Either way, this necklace is awesome! It’s made by If Looks Could Kill Jewels out of laser-cut pieces of acrylic that are hand assembled. You can buy it All-Mighty.com. Lamenting the fact that wearing a pet hermit crab around your neck is not longer politically correct? (I’m not kidding! People used to do this in the 1990s! Gah!) 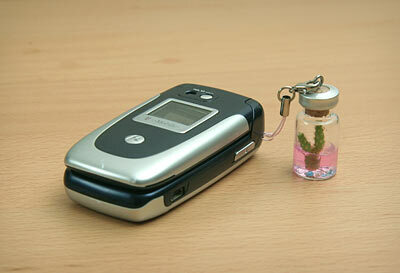 Well now you can move on to an equally lovable and irresistibly tiny pet cactus. 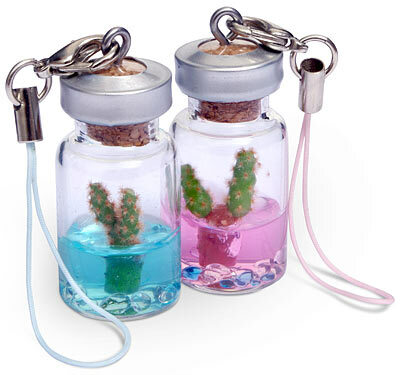 This tiny cactus cell phone charm comes sealed in a tiny plastic jar which contains some sort of gel to keep it alive… for a while I’m guessing. And it can be yours for only $9.99 from thinkgeek.com.